The scent of early summer must include the elderflower. The heady scent of the creamy blooms makes it a lovely ingredient to add into different foods or for making a delicious, sweet Elderflower Cordial. 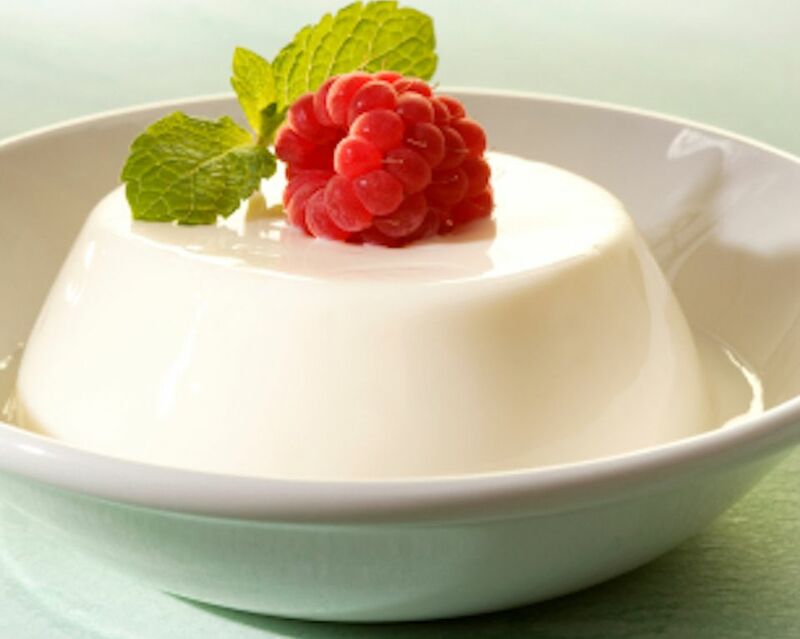 In this Elderflower Pannacotta recipe, the cordial is used to flavor the delicate dessert. The elderflower marries summer fruits with sweet cream and is especially good with cooked gooseberries. Start the Pannacotta by soaking the gelatine sheets in cold water for 4 minutes until softened. Meanwhile, in a large saucepan gently heat the cream with the sugar until the sugar has dissolved. The cream should be hot not boiling. Remove the cream from the heat and put to one side. Squeeze the water from the gelatine and add the squished leaves to the hot cream, stir with a spoon until dissolved, this will only take a minute at the most. Add the elderflower cordial to the cooled cream and stir. Pour the cream into 6 small ramekins or teacups (each about 150ml in volume). When cool, chill in the fridge for at least 4 hours, or overnight. To serve, run the tip of a knife around the edges of the creams then turn out onto serving plates, giving them a good shake to release. Serve with a decoration of summer fruits or with a fruit compote on the side or as suggested above, a little shortbread works really well with this recipe. The literal translation of the name is Cooked Cream, so where this dish varies over a Crème Brulée, is one there is no burned sugar and two, here the cream is cooked. Note: When finished the cooked cream should not be too firm just a soft wobble, known in the culinary world as a Pannacotta Wobble. Just a slight tremble means it is perfect. Serve the Pannacotta with any fresh summer foods, raspberries or strawberries work so well with the scent of the Elderflower. A little shortbread is also lovely. Variations on an Elderflower Pannacotta. The Elderflower cordial used in this recipe gives the cooked cream a supremely delicious flavour, a true scent of summer. But, you can if you wish, vary the flavour you add (if you must). Lavender is a great alternative but approach with extreme caution as the flavour of the flower can very quickly overtake any other in the dish. Use the dried culinary flowers, or the tiniest drop of culinary Lavender Extract.